Build a charcoal fire for indirect cooking with Kingsford® charcoal. Add a small aluminum pan to the void side of the grill and fill halfway with water. When the charcoal grill reaches 250°F, place ribs meat-side up on the grill grate and cook over indirect heat for 2 hours and 15 minutes. Remove the ribs from the charcoal grill and discard foil. 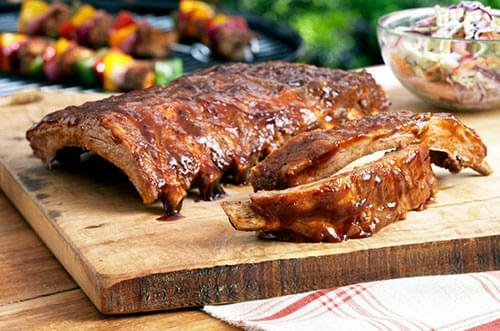 Brush KC Masterpiece® Southern-Style Barbecue Sauce on both sides of the ribs. Place the ribs back on the grill for 15 minutes, or until sauce caramelizes.